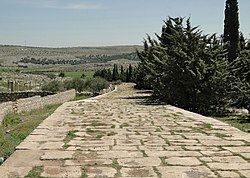 Antioch was founded near the end of the fourth century BC by Seleucus I Nicator, one of Alexander the Great's generals. The city's geographical, military, and economic location benefited its occupants, particularly such features as the spice trade, the Silk Road, and the Royal Road. It eventually rivaled Alexandria as the chief city of the Near East. The city was the capital of the Seleucid Empire until 63 B.C. when the Romans took control, making it the seat of the Roman governor. From the early 4th century the city was the seat of the Count of the Orient, head of the regional administration of sixteen provinces. It was also the main center of Hellenistic Judaism at the end of the Second Temple period. Antioch was one of the most important cities in the eastern Mediterranean of Rome's dominions. It covered almost 1,100 acres (4.5 km2) within the walls of which one quarter was mountain, leaving 750 acres (3.0 km2) about one-fifth the area of Rome within the Aurelian Walls. Antioch was called "the cradle of Christianity" as a result of its longevity and the pivotal role that it played in the emergence of both Hellenistic Judaism and early Christianity. The Christian New Testament asserts that the name "Christian" first emerged in Antioch. It was one of the four cities of the Syrian tetrapolis, and its residents were known as Antiochenes. The city was a metropolis of a quarter million people during Augustan times, but it declined to relative insignificance during the Middle Ages because of warfare, repeated earthquakes, and a change in trade routes, which no longer passed through Antioch from the far east following the Mongol invasions and conquests. The Roman emperors favored the city from the first moments, seeing it as a more suitable capital for the eastern part of the empire than Alexandria could be, because of the isolated position of Egypt. To a certain extent they tried to make it an eastern Rome. Julius Caesar visited it in 47 BC, and confirmed its freedom. A great temple to Jupiter Capitolinus rose on Silpius, probably at the insistence of Octavian, whose cause the city had espoused. A forum of Roman type was laid out. Tiberius built two long colonnades on the south towards Silpius. 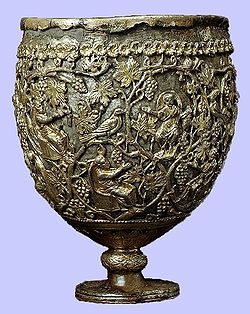 The Antioch Chalice, first half of 6th century, Metropolitan Museum of Art. In 256 AD, the town was suddenly raided by the Persians under Shapur I, and many of the people were slain in the theatre. It was recaptured by the Roman emperor Valerian the following year. Even Julian's piety was distasteful to the Antiochenes even to those who kept the old religion. 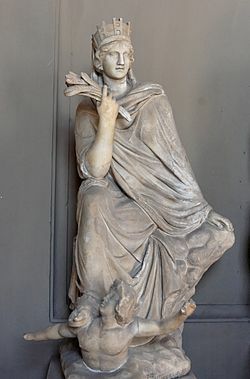 Julian's brand of paganism was very much unique to himself, with little support outside the most educated Neoplatonist circles. The irony of Julian's enthusiasm for large scale animal sacrifice could not have escaped the hungry Antiochenes. Julian gained no admiration for his personal involvement in the sacrifices, only the nickname axeman, wrote Ammianus. Julian's successor, Valens, who endowed Antioch with a new forum, including a statue of Valentinian on a central column, reopened the great church of Constantine, which stood until the Persian sack in 538, by Chosroes. Antioch was a chief center of early Christianity during Roman times. The city had a large population of Jewish origin in a quarter called the Kerateion, and so attracted the earliest missionaries. Evangelized, among others, by Peter himself, according to the tradition upon which the Patriarch of Antioch still rests its claim for primacy, and certainly later by Barnabas and Paul during Paul's first missionary journey. Its converts were the first to be called Christians. This is not to be confused with Antioch in Pisidia, to which the early missionaries later travelled. A bronze coin from Antioch depicting the emperor Julian. Note the pointed beard. Syriac Orthodox Patriarchate of Antioch and All the East, is an Oriental Orthodox Church with autocephalous patriarchate founded by Saint Peter and Saint Paul in the 1st century, according to its tradition.The Syriac Orthodox Church is part of Oriental Orthodoxy, a distinct communion of churches claiming to continue the patristic and Apostolic Christology before the schism following the Council of Chalcedon in 451. The Peutinger Map showing Antioch Alexandria and Seleucia in the 4th century. The Capture of Antioch by Bohemund of Taranto in June 1098. In 1100, Tancred became the regent of Antioch after his uncle and predecessor Bohemond I of Antioch was taken prisoner for three years (1100–03) by Gazi Gümüshtigin of the Danishmends at the Battle of Melitene. Tancred expanded the territory of Antioch by conquering Byzantine Cilicia, Tarsus, and Adana in 1101 and founding the principality, Byzantine Latakia, in 1103. In 1107 Bohemond enraged by an earlier defeat when he, allianced with Edessa, attacked Aleppo, and Baldwin of Bourcq and Joscelin of Courtenay (Bourcq's most powerful vassal) were briefly captured, as well as the Byzantines recapturing of Cilicia and the harbor and lower town of Lattakieh, he renamed Tancred as the regent of Antioch and sailed for Europe with the intent of gaining support for an attack against the Greeks. In 1107-8 Bohemond led a 'crusade' against Byzantium, with the Latins crossing the Adriatic in October 1107 and laying siege to the city of Durazzo (in modern Albania), which is often regarded as the western gate of the Greek empire. Bohemond was outwitted by Alexius, who deployed his forces to cut the invaders' supply lines whilst avoiding direct confrontation. The Latins were weakened by hunger and proved unable to break Durazzo's defenses. Bohemond capitulated in September 1108 and was forced to accede to a peace accord, the Treaty of Devol. The terms of this agreement stipulated that Bohemond was to hold Antioch for the remainder of his life as the emperor's subject and the Greek patriarch was to be restored to power in the city. However Tancred refused to honor the Treaty of Devol in which Bohemond swore an oath, and it is not until 1158 that it truly became a vassal state of the Byzantine Empire. Six months after the Treaty of Devol Bohemond died, and Tancred remained regent of Antioch until his death during a typhoid epidemic in 1112. Immediately after assuming control, Raymond was involved in conflicts with the Byzantine Emperor John II Comnenus who had come south to recover Cilicia from Leo of Armenia, and to reassert his rights over Antioch. The engagement lasted until 1137 when emperor John II arrived with an army before the walls of Antioch. Although the basileus did not enter the city, his banner was raised atop the citadel and Raymond was compelled to do homage. Raymond agreed with the emperor that if he was capable of capturing Aleppo, Shaizar, and Homs, he would exchange Antioch for them. Louis refused to help Antioch defend against the Turks and to lead an expedition against Aleppo, and instead decided to finish his pilgrimage to Jerusalem rather than focus on the military aspect of the Crusades. With Louis quickly leaving Antioch again and the Crusades returning home in 1149, Nur ad-Din launched an offensive against the territories which were dominated by the Castle of Harim, situated on the eastern bank of the Orontes, after which Nur besieged the castle of Inag. Raymond of Poitiers quickly came to the aid of the citadel, where he was defeated and killed at the Battle of Inab, Raymond's head was then cut off and sent to Nur, who sent it to the caliph in Baghdad. However, Nur ad-Din did not attack Antioch itself and was content with capturing all of Antiochene territory that lay east of the Orontes. In 1160 Raynald was captured by Muslims during a plundering raid against the Syrian and Armenian peasants of the neighborhood of Marash. He was held captive for sixteen years, and as the stepfather of the Empress Maria, he was ransomed by Manuel for 120,000 gold dinars in 1176 (about 500 kg of gold, worth approximately £16 million or US$26 million as of October 2010[update]). With Raynald disposed of for a long time, the patriarch Aimery became the new regent, chosen by Baldwin III. To further consolidate his own claim over Antioch, Manuel chose Maria of Antioch as his bride, daughter of Constance of Antioch and Raymond of Poitiers. But the government of Antioch remained in crisis up until 1163, when Constance asked the Armenian Kingdom of Cilicia to help maintain her rule, as a result the citizens of Antioch exiled her and installed her son Bohemond III and now brother-in-law to the emperor, as regent. On April 2016, archaeologists discovered a Greek mosaic showing a skeleton lying down with a wine pitcher and loaf of bread alongside a text that reads: "Be cheerful, enjoy your life", it is reportedly from the 3rd century B.C. Described as the "reckless skeleton" or "skeleton mosaic", the mosaic is once thought to have belonged in the dining room of an upper-class home. ^ Ancient Greek: Ἀντιόχεια ἡ ἐπὶ Ὀρόντου; or Ἀντιόχεια ἡ ἐπὶ Δάφνῃ, "Antioch on Daphne"; or Ἀντιόχεια ἡ Μεγάλη, "Antioch the Great"; Latin: Antiochia ad Orontem; Armenian: Անտիոք Antiok; Syriac: ܐܢܛܝܘܟܝܐ‎ Anṭiokya; Hebrew: אנטיוכיה, Antiyokhya; Arabic: انطاكية, Anṭākiya; Persian: انطاکیه‎; Turkish: Antakya. ^ Sacks, David; Oswyn Murray (2005). Lisa R. Brody (ed.). Encyclopedia of the Ancient Greek World (Facts on File Library of World History). Facts on File Inc. p. 32. ISBN 978-0816057221. ^ "The mixture of Roman, Greek, and Jewish elements admirably adapted Antioch for the great part it played in the early history of Christianity. The city was the cradle of the church." — "Antioch," Encyclopaedia Biblica, Vol. I, p. 186 (p. 125 of 612 in online .pdf file. Warning: Takes several minutes to download). ^ a b c d e Rockwell 1911, p. 130. ^ Libanius (2000). Antioch as a Centre of Hellenic Culture as Observed by Libanius. Translated with an introduction by A.F. Norman. Liverpool: Liverpool University Press. p. 23. ISBN 978-0-85323-595-8. ^ "Syrian Antioch and Pisidian Antioch". Bible Wise. Retrieved 22 September 2017. ^ "s.v. Ἀντιόχεια". Suda. At the Suda On Line project of the Stoa Consortium. ^ This article incorporates text from a publication now in the public domain: Easton, Matthew George (1897). "article name needed". Easton's Bible Dictionary (New and revised ed.). T. Nelson and Sons. ^ Rockwell 1911, pp. 130-131. ^ a b c d e f g h i j k l m n o p q Rockwell 1911, p. 131. ^ John Humphrey (13 February 1986). Roman Circuses: Arenas for Charioteers. University of California Press. pp. 446–. ISBN 978-0-520-04921-5. Retrieved 25 August 2012. ^ Dio Cassius, liv, 9. ^ Ridebatur enim ut Cercops...barbam prae se ferens hircinam. Ammianus XXII 14. ^ Edwards, Robert W., "Antioch (Seleukia Pieria)" (2016). The Eerdmans Encyclopedia of Early Christian Art and Archaeology, ed., Paul Corby Finney. Grand Rapids, Michigan: William B. Eerdmans Publishing. pp. 73–74. ISBN 978-0-8028-9016-0. 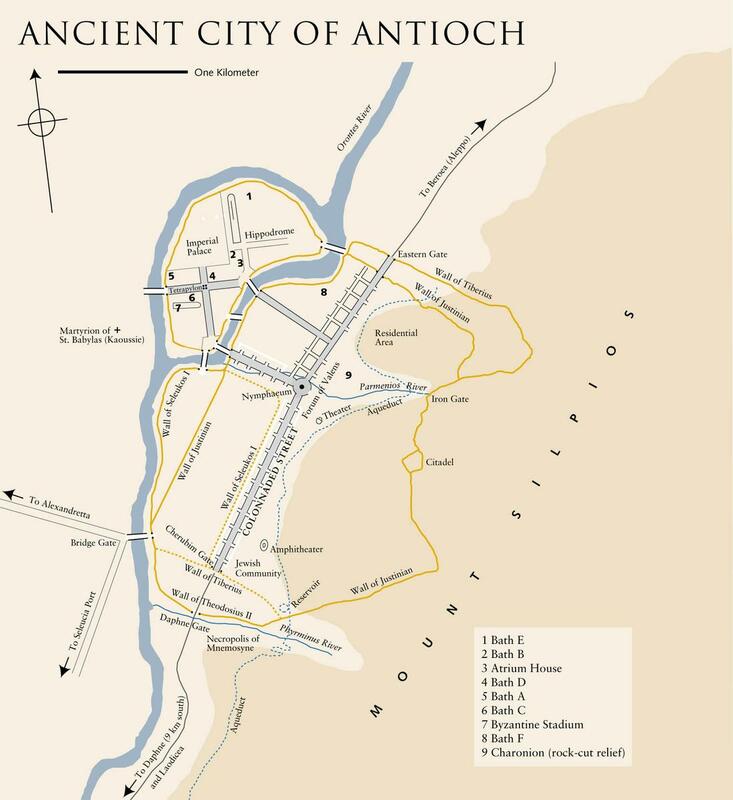 ^ A short history of Antioch, 300 B.C.-A.D. 1268. Oxford, Blackwell. 1921. Retrieved 2013-03-25. ^ A History of the Crusades – Volume II. : The Kingdom of Jerusalem and the Frankish East: 1100–1187. ^ The Armenian Kingdom in Cilicia during the Crusades: The Integration of Cilician Armenians with the Latins (1080–1393). ^ Usmah Ibn Munqidh (1095–1188): Autobiography: Excerpts on the Franks, c. 1175 CE. 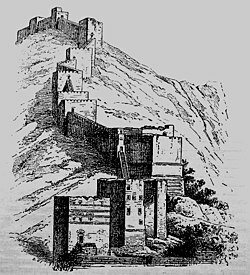 ^ Religious and Military Crusader Orders in Syria in the 12th and 13th Centuries. Amman 2003. ^ Earthquakes in Syria during the Crusades. Cairo 1996. ^ J. N. Kelly, The Oxford Dictionary of Popes, New York: Oxford UP, 1986, 183. ^ Al-Maqrizi, p. 519/vol. 1. ^ See Perry (p. 150), Riley-Smith (p. 237, Baybars ... murdered Qutuz"), Amitai-Preiss (p. 47, "a conspiracy of amirs, which included Baybars and was probably under his leadership"), Holt et al. ^ Runciman, op. cit., p. 326. ^ "Sacred Destinations". Retrieved 2008-07-01. ^ Downey, Glanville (1938). "Personifications of Abstract Ideas in the Antioch Mosaics". Transactions and Proceedings of the American Philological Association. 6: 349–363. JSTOR 283184. ^ Fant, Clyde E.; Reddish, Mitchell G. (2003). A Guide to Biblical Sites in Greece and Turkey. New York, NY: Oxford University Press. p. 150. ISBN 978-0-19-513918-1. ^ Jones, Frances F (1981). "Antioch Mosaics in Princeton". Record of the Art Museum, Princeton University. 40 (2): 2–26. JSTOR 3774611. ^ New mosaic discovery in Hatay, ancient Antioch. Reclining skeleton with the message "Be cheerful - enjoy your life"
This article incorporates text from a publication now in the public domain: Rockwell, William Walker (1911). "Antioch" . In Chisholm, Hugh (ed.). Encyclopædia Britannica. 2 (11th ed.). Cambridge University Press. pp. 130–132. This page was last edited on 16 April 2019, at 12:18 (UTC).